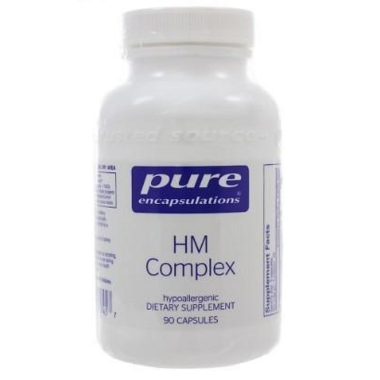 Pure Encapsulations HM Complex is designed to support antioxidant defence, while promoting healthy liver function. A blend of ingredients, including chlorella, lipoic acid, n-acetyl-l-cysteine (NAC), and selenium scavenges free radicals. These antioxidants may also help regulate oxidative stress induced by heavy metals – such as mercury, arsenic, cadmium, lead and tin – that results from common, mild environmental exposure. L-Methionine is an essential amino acid that supports glutathione production and encourages healthy liver function, including healthy hepatic fat metabolism, bile flow and phase II detoxification pathways. HM Complex also contains chlorella, which has a long history of use in traditional medicine, along with modified citrus pectin.8 Modified citrus pectin is unique among other pectins in that it has a low molecular weight, which allows it to easily pass through the intestinal barrier.